I cannot but regret, now that I am concluding my story, how little I am able to contribute to the discussion of the many debatable questions which are still unsettled. In one respect I shall certainly provoke criticism. My particular province is speculative philosophy. My knowledge of com- parative physiology is confined to a book or two, but it seems to me that Carver’s suggestions as to the reason of the rapid death of the Martians is so probable as to be regarded almost as a proven conclusion. I have assumed that in the body of my narrative. At any rate, in all the bodies of the Martians that were examined after the war, no bacteria except those already known as terrestrial species were found. That they did not bury any of their dead, and the reckless slaughter they per- petrated, point also to an entire ignorance of the putrefactive process. But probable as this seems, it is by no means a proven conclusion. Neither is the composition of the Black Smoke known, which the Martians used with such deadly effect, and the generator of the Heat-Rays remains a puzzle. The terrible disasters at the Ealing and South Kensington laboratories have disinclined analysts for further investigations upon the latter. Spectrum analysis of the black powder points unmistakably to the presence of an unknown element with a brilliant group of three lines in the green, and it is pos- sible that it combines with argon to form a compound which acts at once with deadly effect upon some constituent in the blood. But such unproven speculations will scarcely be of interest to the general reader, to whom this story is addressed. None of the brown scum that drifted down the Thames after the destruction of Shepperton was examined at the time, and now none is forthcoming. The results of an anatomical examination of the Martians, so far as the prowling dogs had left such an examination possible, I have already given. But everyone is familiar with the magnificent and almost complete specimen in spirits at the Natural History Museum, and the countless drawings that have been made from it; and beyond that the interest of their physiology and structure is purely scientific. A question of graver and universal interest is the possi- bility of another attack from the Martians. I do not think that nearly enough attention is being given to this aspect of the matter. At present the planet Mars is in conjunction, but with every return to opposition I, for one, anticipate a renewal of their adventure. In any case, we should be prepared. It seems to me that it should be possible to define the position of the gun from which the shots are discharged, to keep a sustained watch upon this part of the planet, and to anticipate the arrival of the next attack. In that case the cylinder might be destroyed with dyna- mite or artillery before it was sufficiently cool for the Mar- tians to emerge, or they might be butchered by means of guns so soon as the screw opened. It seems to me that they have lost a vast advantage in the failure of their first surprise. Possibly they see it in the same light. Lessing has advanced excellent reasons for supposing that the Martians have actually succeeded in effecting a landing on the planet Venus. Seven months ago now, Venus and Mars were in alignment with the sun; that is to say, Mars was in opposition from the point of view of an observer on Venus. Subsequently a peculiar luminous and sinuous mark- ing appeared on the unillumined half of the inner planet, and almost simultaneously a faint dark mark of a similar sinuous character was detected upon a photograph of the Martian disk. One needs to see the drawings of these ap- pearances in order to appreciate fully their remarkable resemblance in character. The broadening of men’s views that has resulted can scarcely be exaggerated. Before the cylinder fell there was a general persuasion that through all the deep of space no life existed beyond the petty surface of our minute sphere. Now we see further. If the Martians can reach Venus, there is no reason to suppose that the thing is impossible for men, and when the slow cooling of the sun makes this earth uninhabitable, as at last it must do, it may be that the thread of life that has begun here will have streamed out and caught our sister planet within its toils. Dim and wonderful is the vision I have conjured up in my mind of life spreading slowly from this little seed bed of the solar system throughout the inanimate vastness of sidereal space. But that is a remote dream. It may be, on the other hand, that the destruction of the Martians is only a reprieve. To them, and not to us, perhaps, is the future ordained. I must confess the stress and danger of the time have left an abiding sense of doubt and insecurity in my mind. I sit in my study writing by lamplight, and suddenly I see again the healing valley below set with writhing flames, and feel the house behind and about me empty and desolate. I go out into the Byfleet Road, and vehicles pass me, a butcher boy in a cart, a cabful of visitors, a workman on a bicycle, children going to school, and suddenly they become vague and unreal, and I hurry again with the artilleryman through the hot, brooding silence. Of a night I see the black powder darkening the silent streets, and the contorted bodies shrouded in that layer; they rise upon me tattered and dog-bitten. They gibber and grow fiercer, paler, uglier, mad distortions of humanity at last, and I wake, cold and wretched, in the darkness of the night. I go to London and see the busy multitudes in Fleet Street and the Strand, and it comes across my mind that they are but the ghosts of the past, haunting the streets that I have seen silent and wretched, going to and fro, phan- tasms in a dead city, the mockery of life in a galvanised body. And strange, too, it is to stand on Primrose Hill, as I did but a day before writing this last chapter, to see the great province of houses, dim and blue through the haze of the smoke and mist, vanishing at last into the vague lower sky, to see the people walking to and fro among the flower beds on the hill, to see the sight-seers about the Mar- tian machine that stands there still, to hear the tumult of playing children, and to recall the time when I saw it all bright and clear-cut, hard and silent, under the dawn of that last great day. . . .
And strangest of all is it to hold my wife’s hand again, and to think that I have counted her, and that she has counted me, among the dead. 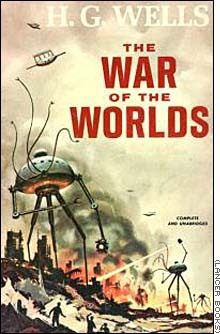 This complete text of The War of the Worlds by Herbert George Wells is in the public domain. This book has been made into a movie: The War of the Worlds (at Amazon).